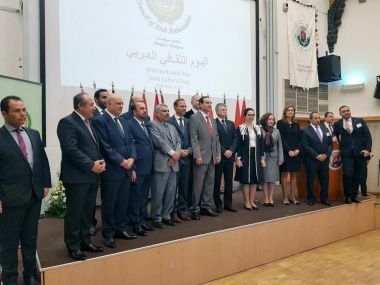 BUDAPEST-- The Speaker of the National Assembly of Hungary Kover Laszlo hailed Sunday the Kuwaiti parliamentary experience as a good example to be followed in the region. The Kuwaiti experience is close to the European model, Laszlo told KUNA on the sidelines of the Arab Cultural Days in Budapest. He expressed hope of raising the level of Kuwaiti-Hungarian parliamentary cooperation to the highest levels, to serve interests of the two countries. He pointed to upcoming visit of Kuwaiti-Hungarian parliamentary friendship delegation to Budapest on April 25, as it would launch a new phase of cooperation between parliamentarians. He also expressed hope that the visit of the parliamentary friendship delegation will follow activation of an official invitation addressed to Kuwaiti National Assembly Speaker Marzouq Ali Al-Ghanimt to visit Budapest. On the European view of the Arab civilization, Laszlo said that the Europeans have learned from their sources and absorbed the movement of history and civilization in the past, which helped them to create the present and shape the future. He also pointed to what been offered by Arab civilization to humanity from science and knowledge, which was the basis of modern technological development. For his part Kuwait Ambassador to Hungary Dr. Hamad Borhama said, helding this event in Budapest for the third year in a row is an important opportunity to present the cultural heritage of the Arab nation to the Hungarian people, of which it contributed greatly to the scientific development of the Western world. Kuwait in addition to 14 Arab countries participated in the event, which began on Thursday and ends later Sunday, Borhama said. The Arab wings participated at this event has a distinct role in the definition of Arab and Islamic civilization and achievements in the field of universal human values, fine arts and various sciences and the importance of the role of culture in bringing people together, he said. He pointed out that the Kuwaiti participation in this Arab cultural event had a good impact through the cultural, economic and media seminars organized on the sidelines of the cultural days in Budapest, especially the valuable lecture for the Director General of Kuwait National Library Kamel Al-Abduljalil. He also praised the visit of the Hungarian parliament speaker to the Kuwaiti pavilion and his welcome for the upcoming visit of the parliamentary delegation, as well as looking forward to visit National Assembly Speaker Marzouq Al-Ghanim to Budapest to discuss ways of enhancing parliamentary cooperation between Kuwait and Hungary. On the relations between Kuwait and Hungary, Ambassador Borhama praised the level of distinguished relations between the two countries, noting that the two countries celebrated the 50th anniversary of the establishment of their diplomatic relations five years ago and look forward to developing these historical relations on various levels. This Arab event in Budapest included a number of Arab cultural activities and varied program and artistic exhibitions and shfolkloric dances for a number of Arab artistic groups included cultural seminars for lecturers from Arab countries. Kuwait participated in this important event with a large cultural pavilion, during which some works were exhibited to a number of Kuwaiti plastic artists and exhibits on folklore, handicrafts and pottery. The pavilion also presented a number of books and posters dealing with the cultural development of Kuwait. KUWAIT-- Speaker of the Tunisian Assembly of the Representatives of the People Mohammad Ennaceur expressed his pride in His Highness Amir Sheikh Sabah Al-Ahmad Al-Jaber Al-Sabah and his actions on the Arabic and International levels. Ennaceur met with His Highness the Amir at Bayan Palace earlier today and said, "I conveyed President Beji Caid Essebsi's greetings to His Highness the Amir, and affirmed his important contribution in the 30th Arab Summit held in Tunisia last March, which was as usual a word of wisdom and poise. "We talked about the general situation in the region and discussed his initiatives towards brotherhood and cooperation, and I showed pride in his acts on the international level," Ennaceur continued. "We stressed on the strong bilateral ties between Kuwait and Tunisia in all fields, and this visit confirms the deep bonds between the Tunisian and Kuwaiti peoples and we will continue on the parliamentary level to support this relationship in serving Arabic and International issues," he added.